Studying for the theory test doesn’t have to be hard. Prepare for your theory test with confidence knowing you’re using the latest revision questions, answers, explanations and hazard perception videos, licensed by DVSA (the people who set the theory test). Car theory test learners also get exclusive use of our brand-spanking new and exciting theory test practice tutorial videos. Interested? See for yourself how easy it is to learn your Car theory by watching videos. Looking for LGV CPC Module 2? See what we offer for the LGV CPC Module 2 theory test. You’ll always get the latest revision questions, answers, explanations and hazard perception videos because we’re a Crown Copyright holder with the DVSA – the people who set the tests. Everyone loves videos, right?! Car theory test candidates can now learn using our brand new exclusive videos. These simple videos help boost your chances of passing the real test. All of your scores are in one place. This means you can learn whenever you want, on any device you want. And with our amazingly simple apps you can even learn offline. 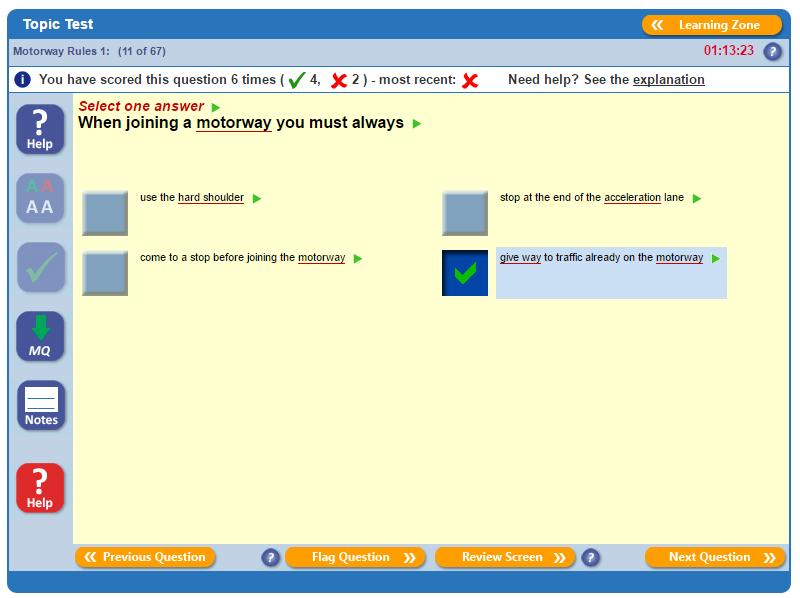 Theory test practice features you’ll use time and time again. Driving Theory 4 All’s practice theory tests include the latest revision DVSA practice theory test questions, answers and explanations. They’re also designed to be just like the real DVSA theory test, so you’ll know what to expect come the big day! Driving Theory 4 All introduces a fun, engaging, and unique way to practice for the Car theory test. You can now fully prepare for your Car theory by watching our animated videos. And because they cover everything you’ll be tested on in the real DVSA Car theory test, they’re a perfect companion to our practice theory tests. Theory test practice features, like 50/50 and instant answer feedback, will speed up your learning and help you prepare for your theory test in the shortest possible time. You can learn on the go, anytime, anywhere with our user friendly mobile website. If you’re revising for the Car, Motorcycle, ADI Part 1, LGV or PCV theory test, you can also download our iOS and Android apps and learn without ever needing an Internet connection. Forget complex charts that are impossible to understand. Say “hello” to easy to read scores just how you want them. Your online dashboard gives you a quick and simple overview of how you’re progressing. Available for anyone taking the Car, Motorcycle, ADI Part 1, LGV, or PCV theory tests. Want to try before you buy? Watch a theory training tutorial video and take a practice theory test to see how you get on. Available for anyone taking the Car theory test. Meet our newest addition. Learn your Car theory by watching our all-new videos. Introducing videos. One thing is for sure, everyone loves to watch and learn using videos. Exclusively to Driving Theory 4 All Car theory test learners, our top-notch theory test practice videos will help you learn key information essential for passing the Car theory test in a simple and no-nonsense way. Not only are our theory test videos a brilliant learning tool but they’re fast and easy to use. And they’re available to you 24/7. The videos will introduce you to our aptly named Stick family. You’ll be taken on a journey with them in each video. They’re just your average everyday family (well, we’ll let you be the judge of that). Our unique theory test videos are all-purpose. They’re ideal when first starting to learn your Car driving theory and for reinforcing what you’ve learnt in the practice theory tests. Pictorials that are proven to help you PASS. Our pictorials help you revise for the DVSA Car, Motorcycle, and LGV theory test by looking at pictures and diagrams. Work your way through each topic you’ll be tested on in the theory test with our picture based learning. 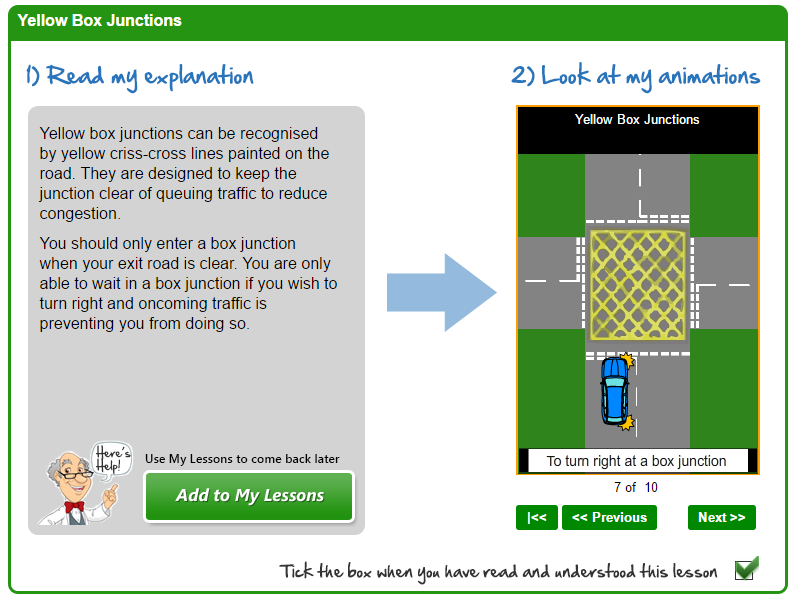 This tried and tested learning tool is fantastic for helping you practice for the theory test. You’ll see pictures and diagrams along with explanations for every DVSA topic. This means that the pictorials are not only a great place to start your learning but they’re equally good at helping to reinforce what you’ve learnt from taking practice tests. Available for anyone taking the Car, Motorcycle, or LGV theory tests. Our pictorials help you revise for the DVSA Car, Motorcycle, and LGV theory test practice material by looking at pictures and diagrams. Work your way through each topic you’ll be tested on in the theory test with our picture based learning. The latest revision practice questions are written and maintained by the DVSA (the people who set the theory test), so they’re the closest you’ll get to the questions in the real theory test. Practice makes perfect. The more you practice with mock theory tests the better chance you’ll have of passing your real theory test and reducing your nerves on the day of the test. You’ll find all of our mock theory tests are different to ensure you get the chance of answering every practice question. Forget practising with anything other than the most up-to-date theory test questions. We have full access to all of the DVSA practice questions because we’re a Crown Copyright licence holder with the DVSA. Not every theory test training provider can say this. This means that you’ll always get the latest theory test questions to practice with. Listen to every theory test practice question, answer and help explanation in clear, crisp English. Each word is highlighted as it is being read to you, making it much easier for you to follow. This unique feature is especially helpful if you struggle to read. Our intelligent Theory Test Master builds tests for you based on your progress. For example, you can take practice theory tests on questions you’re struggling with and questions you haven’t yet seen. This ensures your learning is personalised specifically to your needs, so you’re not revisiting areas you already know and wasting your time. You can hide some incorrect answers during a practice theory test using our 50/50 feature. If you’re still really stuck, or just want the answer quickly, you can get instantly get the answer for the question you’re attempting. You can add any practice theory test question to My Questions to review at any time. You can then take a practice test on questions you’ve only added to My Questions. This is a great way to improve. Studying for your driving theory can be a daunting task and you’ll need to remember lots of potentially new words. You’ll find learning difficult, technical and unusual words easier with our glossary. Glossary explanations are short, simple and written in normal, everyday words you’ll understand. There’s no substitute for hazard perception tests that replicate the real test. 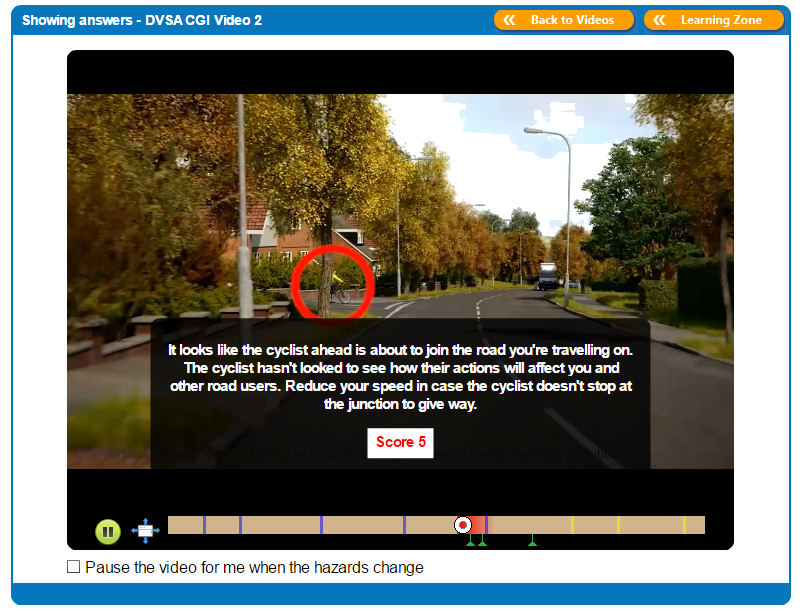 Driving Theory 4 All gives you 10 completely new DVSA CGI (computer-generated imagery) hazard perception test practice videos, as well as many more video clips for you to practice with. All hazard perception test videos feature everyday road scenes and contain at least one developing hazard. Like in the real DVSA hazard perception test, the earlier you notice and click for a developing hazard, the higher your score will be. Driving Theory 4 All uses exactly the same scoring system as the real DVSA hazard perception test. This allows you to get familiar with the structure of the test and the types of developing hazards you’ll see before you take the real test. 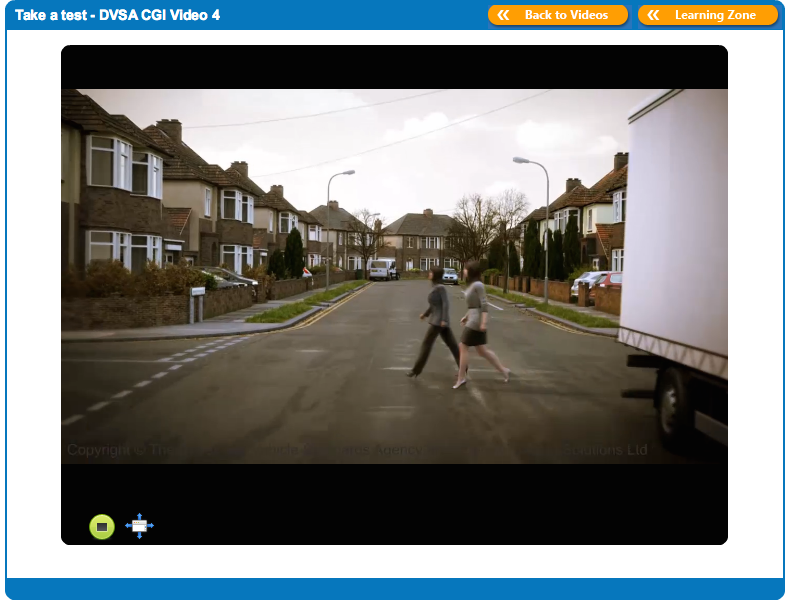 Like the DVSA hazard perception test, you’ll be marked out of 5 or 10 in each of our hazard perception clips. The most you can score for each developing hazard is 5, so you’ll see either 1 or 2 developing hazards per video. You’ll find out your result at the end of each video clip. Cheat detection for every hazard perception test video means you’ll know at the end of each video whether you have over clicked or clicked in a pattern. Just like in the DVSA theory test, if you over click or click in a pattern you’ll score 0 for that video. This ensures you’re fully aware of what to expect on the day of the test and fully prepared for the real test. Get instant feedback and valuable help with the Answer Videos. Every hazard perception test video has a completely separate Answer Video. It is here you’ll discover continuous full help explanations throughout each clip. The instant help will give you advice on where you need to click to score maximum marks and why you need to click at specific times. You can see where you clicked after every hazard perception test video you take. This is a fantastic feedback tool because you can see where you clicked and where you need to click to achieve maximum marks and why. Knowing where to click in different types of road situations could be the difference between passing and failing the DVSA hazard perception test. Find out what we offer for every DVSA theory test by selecting the theory test you want to prepare for.